You might be here thinking, I’m not a perfectionist because everything I do isn’t perfect. It happens a lot that I listen to a client telling me how they’ve failed in some way that others might perceive as a success. Does that sound familiar? You’ve completed a project, but it wasn’t quite up to the standards you set for yourself. But the people around you are patting you on the back and letting you know how great your presentation was. But all you can think is yes, but… But there were 4 typos in the presentation. But two slides were out of order. But I stumbled over my words in the beginning. Perfectionism is a common problem in people with high-functioning anxiety. 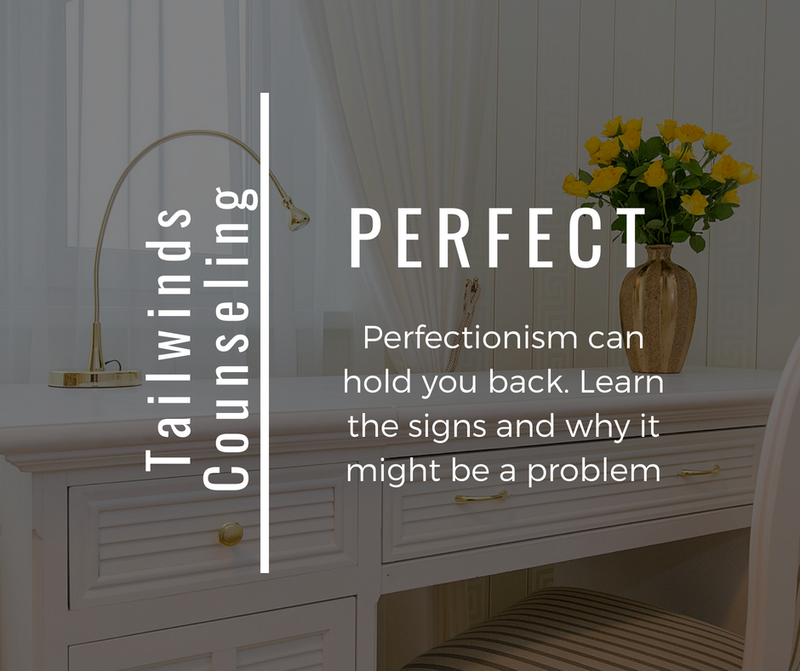 In therapy sessions with my clients, some form of perfectionism frequently comes up in one way or another. But it’s usually not the reason someone comes in. It is, however, a major factor related to the anxiety they feel. 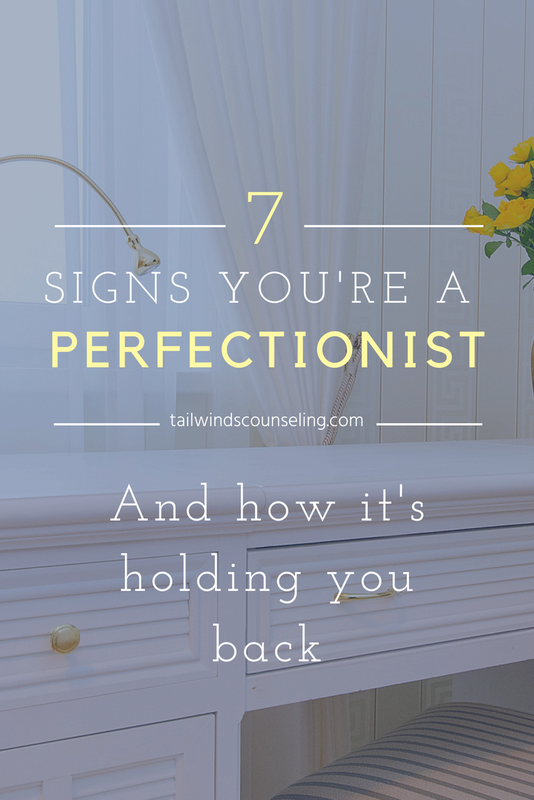 So I thought it would be helpful to share with you 7 signs you’re a perfectionist and why it’s holding you back. If someone looked at your Google search history, they’d find you searching for answers you already know because you need confirmation. They’d find you spend absorbent amounts of money on courses teaching you to do things that you never actually ended up doing. You’re always looking for the newest training or certification in your career so that you can feel more qualified, more respected. But no matter how much you learn or how many letters are after your name, you never feel like you know enough. You don’t speak up because you can’t find the right words. Do you ever find yourself in a conversation or a meeting and you’ve got something to say, but you can’t quite find the right phrasing? And rather than sharing a less than polished response, you don’t say anything at all. Or maybe you finally find the right words, but you find the topic has changed and it’s no longer relevant. Or maybe someone else spoke up first with your same idea and the room went wild over it. And then you beat yourself up over not finding the words sooner. It takes you forever to finish something. Or maybe you never finish at all. It goes like this. You get an idea. You start the research (see #1). You gather the tools you need. You sit down to finish the task. But wait. There’s a small detail that you’re not quite sure of. You think you know, but you want to double check. And now you’re down the rabbit hole. You feel like you need to be an expert in every aspect of what you’re doing and you lose sight of the original goal. You get frustrated and you stop. Guests are coming and it’s time to clean the house, but you’ve only got 30 minutes. Some people would say, no problem. I’ll pick up the things that are out of place, make sure the toilets are clean, and maybe run a vacuum through high traffic areas. But that’s not you. You feel irritated by the short notice and bust out the rubber gloves. You’re cleaning on overdrive. Your guests arrive and the first thing out of your mouth it, I’m sorry the house is such a mess! And you’re sweating. Unmet goals lead to demoralizing, negative self-talk. That voice in your head that’s beating yourself up for not getting the 24th thing checked off your day’s to-do list is unrelenting. It tells you you’re worthless, you’re stupid, you don’t deserve what you have and you’ll never be good enough. You think about all the reasons you shouldn’t do something. All the ways you could fail. How embarrassed you’d feel if things don’t go the way you plan. And your expectations are through the roof. It’s paralyzing. The bar is so high, you can barely see it and the overwhelm is almost unbearable. So you wait. You find something to do that’s right inside your comfort zone and you avoid the things that are a stretch. You’re not just critical of yourself. You’re also critical of the people around you. Your partner complains that you’re always correcting them. You have to bite your tongue when someone misspeaks and simply moves on. You want to point out that your colleague used the wrong form of there. It affects your relationships because maybe people feel like they have to be on their best behavior around you or they see you as uptight. Maybe you got a clue from the signs, but maybe you’re still thinking perfection sounds like a good thing. Who doesn’t want to be perfect? If I’m perfect, no one can criticize me or tell me that I’m wrong. I’m invulnerable if I’m perfect. But the thing is, no one can be perfect all the time. Frankly, few people are even perfect most of the time. And the pressure to feel like everything has to be just so can lead to a constant feeling of anxiety. A lot of times, letting go of the quest for perfection and finding comfort in good enough can be life-changing. Perfectionism steals from you and it steals from the people who interact with you. If you can’t put something into the world unless it’s perfect, then the world misses out on whatever gifts you have to share, but don’t because a small detail isn’t perfect. Let me show you what I’m talking about. Let’s say a teacher has a bomb idea for a lesson plan that’s going to knock her students’ socks off. She thinks about the details and writes down a bunch of ideas. She actually spends quite a bit of time doing this. Maybe 6 or 8 hours. But in the end, she can’t get it quite right. It’s done, but it’s not great, so she goes to school and teaches it the way she always has. The students don’t benefit from the hours of work the teacher put in and the teacher wasted 8 hours and feels like she failed. Perfection is not serving anyone here. Have you ever had someone give you awesome feedback on something you thought was just ok? Your “just ok” thing made an impact on someone. Talent and ideas are nothing without something to show for it in the end. So if you saw a bit of yourself in this post, I challenge you to make your mantra this well-known quote: “Done is better than perfect.” As a recovering perfectionist, I remind myself of that too. So tell me, how is perfectionism at play in your life? Is it helping or hurting? Let me know in the comments below!